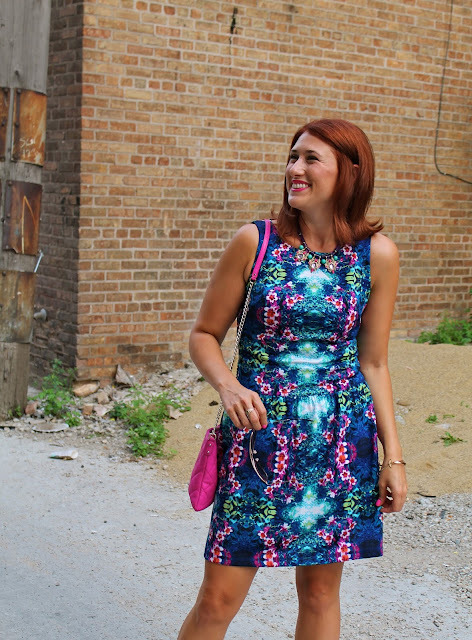 This dress was finally able to be worn a few weeks ago for the Style Chicago beauty event at Venue One. We arrived very late because my friend Elisa (see her & her outfit details below!) and I were trying to find the location based on a foggy memory of where we though Venue One was from years past. We got wrist-banded and invited to an after party all before realizing we were in the WRONG event! It all looked fashion-y from the outside but when we went in the event was set up like a fashion show including models getting ready and everything. Turns out if you show up at the wrong party looking like you meant to be there, no one notices. We turned around embarrassedly, walked out and had a good laugh while we walked to the correct address. Good Times! You both look gorgeous, and that is pretty awesome they let you into an event you weren't meant to be at! HAHAHAHAHAHA I just read this, this is awesome and hysterical!!! What a great story! HA-LARIOUS!!! Loved that you strolled into wrong party!! Totally something that would happen with Elisa. LOL. You girls look tres chic!